The Pima County Tea Party Patriots held the second secret GOP Congressional Primary Debate among Republican candidates for Tucson’s CD2 — but refused admission to this reporter for the Blog for Arizona. The covert rendezvous took place last night at Pima Community College Northwest campus on Shannon Road under heavy police guard. I saw candidates Brandon Martin and Danny Morales lurking by the front door, but front-runner Lea Marquez-Peterson skipped the closed event. The registrar said 80 people were expected to attend and about 60 were let in. “Yes, I am,” I said. He was referring to my attendance at the GOP’s March 24 secret CD 2 Congressional Candidate Forum at the Oyster Club. It seems the Tea Party Patriots read my report Fear Dominates Secret Tucson GOP CD 2 Congressional Candidate Forum and knew me on sight. They probably also read Tim Steller’s newspaper article in The Daily Star about my report. That’s real paranoia. I’ve attended and reported on half a dozen Democratic candidate forums with no problem, including the Feb. 25 forum in Green Valley, which attracted 400 attendees. But the Tea Party “Patriots” and the GOP don’t want a free press attending their events, even when the speakers are candidates who are running for elected public office. Consider what might be reported! That the candidates want Special Counsel Robert Mueller to be fired? That in the wake of mass shootings, gun laws should be loosened? That the US should pre-emptively launch a strike on North Korea? That the DACA recipients should be rounded up by ICE and deported? All of these ideas were supported by the candidates at the last forum. It is clear that the once-vaunted Pima County Tea Party Patriots have degraded into a splinter group, becoming a secret society like the Illuminati or Scientology. 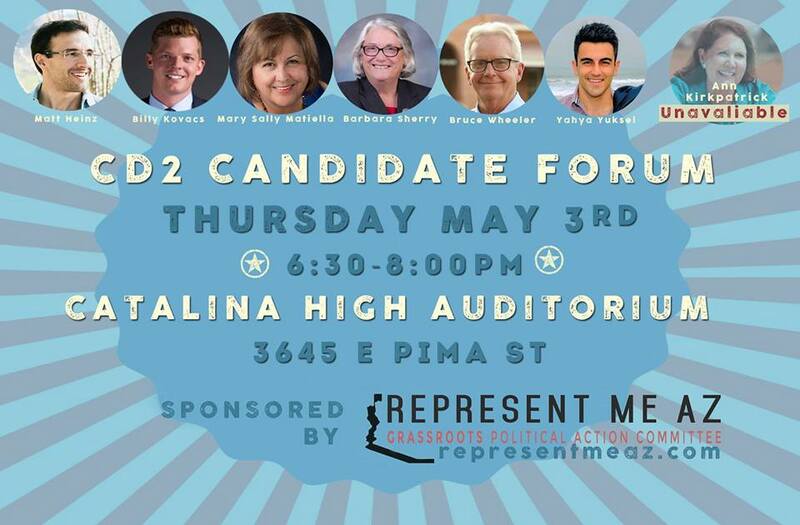 Meanwhile, I recommend you attend Thursday’s CD 2 Democratic Candidate Forum sponsored by Represent Me AZ. You’ll hear real candidates who are not afraid to let their opinions be known in public, and who welcome reporters to attend. It will start at 6:30 pm on May 3 at Catalina High School, 3645 E Pima St., Tucson, AZ 85716. More info is at https://www.facebook.com/events/462727204182164/. Previous articleThe voters won’t forget! Next articleWhat’s up with the Patriot Movement support for Governor Ducey?